Park Theatre is the brainchild of Artistic Director, Jez Bond, and Creative Director, Melli Bond, who – following a six year London-wide search for a building – discovered a vacant office block next to Finsbury Park station in 2010. Garnering support from the theatre community at large – including luminaries such as Ian McKellen and Alan Rickman, the press and, importantly, local residents – they set out to raise the necessary funds to convert the tired concrete building into a thriving new theatre and beacon for the community. At a cost of just £2.6 million, the building, designed by David Hughes Architects, opened in May 2013 to rave reviews from the critics. Nearest Tube station is Finsbury Park (Station Place Exit). Exit left out of Station Place then left and under the bridge. Then second left onto Morris Place, Park Theatre is at the end. Age Restrictions: Children under 14 will not be admitted. The distance between us can grow without taking a single step. Steven, recently separated and heading towards divorce, bumps into an old friend on the journey to a job interview. A complex recent past and a fragile present collide, as Steven tries to make sense of the world around him and his place within it. We accelerate headlong into Steven’s chaotic and troubled inner life, as the everyday encounter unravels into something dark, disturbing and unrestrained. 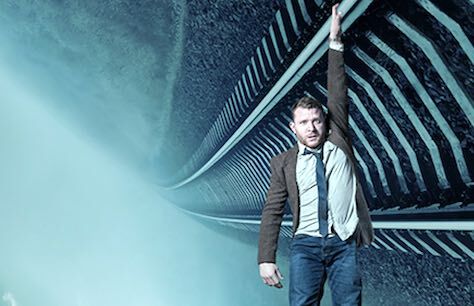 Following the acclaimed Out Of The Cage (Park Theatre), Fine Line, Alex McSweeney and Simon Pittman, return with this powerful contemporary story, to bring you a darkly funny, physically dynamic and technically bold portrayal of the mind. Distance is an urgent examination of mental illness, and its impact on the individual, their family, and the society around them.